Former Charlotte 49ers men’s soccer All-American and Major League Soccer’s Chicago Fire goalkeeper Jon Busch has been named to the United States soccer senior national team roster for the 2009 CONCACAF Gold Cup. Busch, who was the 2008 MLS Goalkeeper of the Year, is one of three goalkeepers on the team. 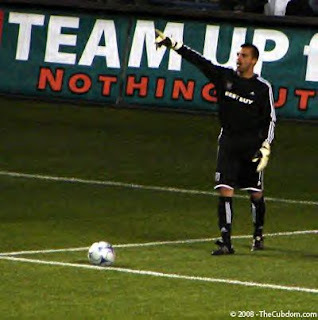 Busch, who played in the 2004 MLS All-Star game as a member of the Columbus Crew, posted a shutout against Colombia as a member of the United States National team in March of 2005. The CONCACAF Golf Cup runs through July 26. The U.S. team opens group play against Grenada on Saturday at Seattle’s Qwest Field. The United States faces Honduras on July 8 at RFK Stadium on Washington D.C. Then, the United States concludes group play against Haiti at Gillette Stadium in Foxborough, Massachusetts, July 11. At Charlotte, Busch was named first-team All-America by the NSCAA in 1996 as he helped lead the 49ers to their first-ever appearance in the College Cup and a school-record 19 wins. In 1996, he recorded a career-high 12 shutouts, including two in the NCAA Tournament, and a career-low 0.89 goals against average. Busch = stud. We would have never made it to the Semifinals in Richmond in '96 with any other Keeper. TRUE leader!